Final Fantasy IX's music, piano-fied. Instead of forging ahead in new directions, Final Fantasy IX's soundtrack retreads familar ground. As the game was a retrospective of Final Fantasy past, so is the soundtrack. This filters its way into the game's piano collection CD. There have always been issues when bringing Final Fantasy music into the realm of piano. On the one hand, Uemastu-san has to spice up the songs up, but doesn't that change the song? What songs should be put on a CD - the game's major themes or the lesser known songs? Despite these problems, the Final Fantasy piano collections have always shined as wonderful examples of subtletly and grace. FFIX's tracks are no exception to the rules. It has a mix of FFIX's major themes and lesser known anthems, jazzed up for their reincarnations, but not unidentifably so. The CD oscillates between the game's two extremes - sorrow and energy. Tracks like "Eternal Harvest" (1) and "Final Battle" (2) move along at a brisk pace. Others, like "Bran Bal, The Village Without Souls" (6) and "The Place I'll Return to, Someday" (3) take a more introspective tone. The classic pieces "You're Not Alone!" (8) and "Melodies of Life" (14) seem to fall somewhere in between. Even the OST's blander tracks, like "Sleepless City Treno" (11), have a new life on the piano CD. However, some of the tracks, most notable the dignified "The Place I'll Return To, Someday," go off into wild tangents halfway to two thirds of the way through the song. The piano arrangements lend both a slyness and a serene dignity to the tracks on the CD. However, this is probably the CD's biggest downfall. If you don't like piano music or get bored easily, then the CD will grate on you before you hit "Melodies of Life." If you apperciate slower, softer music, though, you'll be in heaven with this CD. 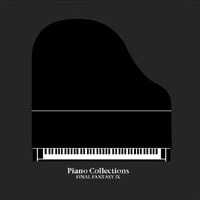 If you liked the previous Final Fantasy Piano CDs, you should add IX to your collection. It matches both VI and VIII in depth and beauty and even is able surpass it's predecessors in some areas. Only it's niche status (even among RPG'ers) keeps it from earning 90% or more.